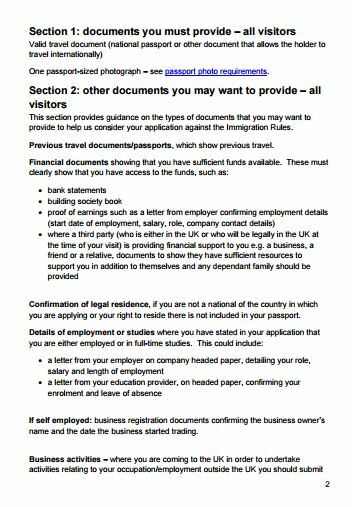 What should we do about a UK Standard Visitor visa refusal (V4.2(a,c))? Today, my mother's UK visit application got rejected. We live in Pakistan, and here, mostly, the property is owned by the males. Therefore, in our case, my mom does not have any property in her name. But both my mom and dad share a joint bank account. And my mom is a housewife, therefore, she is supported by my dad. With her visa application, I submitted dad's ID card copy, her bank statement, and my dad's land document (along with sponsor's documents like bank statement, employer's letter, pay-slips, property inspection letter). But still her application got rejected. Can someone please tell what should we do about it and what should we submit to overcome this rejection again? Thanks for including the refusal notice, it becomes pretty clear what happened. The Entry Clearance Officer's 'legal' grounds were Appendix V 4.2 (a, c). If this is taken in the context of the refusal notice it means they concluded that your mother would go underground and become reliant upon public funds and possibly a drain on the National Health Service (NHS) (you didn't mention her age or if she is an empty nester). Visitors are not supposed to rely upon public housing or income support and there are some strict guidelines about accessing the NHS. Whether their decision was right or wrong is something we can't decide here, we are not the Tribunal, but fixing their perception is going to take quite a lot of work. The ECO was OK with your proposed sponsorship arrangements. As an aside, it's better to have your sister be the sponsor rather than a second degree relative. Even if she has to rely upon your Brother-In-Law's (BIL) documents to establish her capacity, if she has ILR or citizenship she qualifies and it makes a more cohesive application. They understand that wives and mothers may not work and they do not refuse on that basis alone. If your sister is in public housing, she should get a letter from the council saying that it's ok for your mother to stay there as a visitor. Not everybody does this but it's a solid-gold remedy for co-sponsoring problems. Your sister should also include an attestation that she will be in the UK for the entire duration of your mother's visit. This became part of the rules last spring and the ECO didn't call you on it, but might the next time. Moving on to paragraph 3... The ECO points out that the documentation was in serious default. It looks like you didn't read the guidance at all; had you shown your stuff to a UK solicitor beforehand they would have refused to represent you. They want to see a stable stream of cash flows in and out of a bank account (from a bank that they have not blacklisted) that indicate substantial ties to the Pakistani economy. Secondarily, they also want to see documentation that indicates social ties. Given that your mother is reliant upon her husband, you would need to include some stuff that supports that relationship, minimally a marriage certificate, birth certificates and the like. If your mother is not listed on the property deeds and not a signatory on a bank account and has no other supporting evidence of social/economic ties and has no significant travel history (and for sure they checked her English speaking competence at the interview), then yes her application would be precarious. They would be justified to conclude that she does not understand the rudiments of personal finance as it pertains to travel and thus is not ready to travel by herself far away from Pakistan. In this case you or your father should consider accompanying her. Summary: I see lots of problems here and it looks like the ECO made a good call. However, there's a bright side. The application reached the interview stage! That's a very positive sign because most refusals never get that far. It's impressive. I would interpret that to mean they found no credibility problems and you didn't try to paint them a picture, so they went the second mile. Plus there's no hint of credibility issues in the refusal notice (that's part of why we need to see the WHOLE notice!). Your mother's credibility appears to be intact. Encouraging. I emphatically recommend that you do not damage it by submitting another application in reactive mode. Depending if your sister qualifies, there's a great solicitor at the Camden Law Centre who has worked with Pakistani families on a pro bono basis. Plus you can also get some advice from one of the fee earners listed on the ILPA pages. Your BIL should sit down and clear his mind and write down each and every question that occurred during the interview, it should include everything. Spend a few days on it if necessary. A lawyer will be very grateful for a complete transcript reconstructed. Getting some quality legal advice is your next step. Not the answer you're looking for? Browse other questions tagged visa-refusals pakistani-citizens standard-visitor-visas or ask your own question. 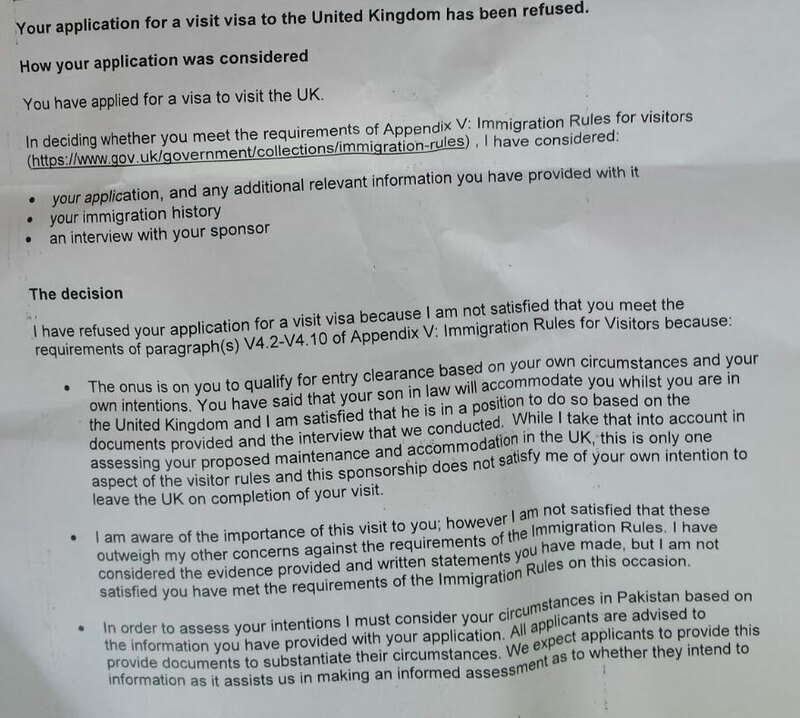 UK Standard Visitor visa refusal: what went wrong? How to write a letter of complaint after a UK visa refusal? I've applied for a UK Standard Visitor visa to attend to my sick husband, but my application was refused. How should I reapply?